Donald W Muggeridge was one of the pioneer mill researchers of the 1930s. 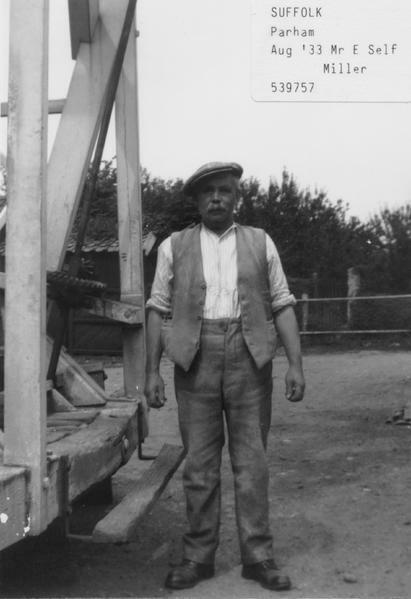 A Kentish Man, he was born in the early 20th century and inherited his father's (William Burrell Muggeridge) interest in windmills. Donald was married to Vera in 1936. He volunteered the month after WWII broke out and escaped from the Dunkirk beaches without injury. In 1943 he returned to Kent for officer training, and in the same year his only son, Derek, was born. In the final phase of the war, with an armoured division travelling from Normandy to Berlin, Donald still managed to take more than 400 photographs of mills. In 1956 Donald and Vera moved to Canada, and later to California, where he retired in 1983 and still lives. This is a digital copy of a photograph held by the University of Kent. A higher resolution copy can be viewed for free at the Mills Archive; please email visitors@millsarchive.org to arrange an appointment. Permission to reproduce the image should be addressed to the University of Kent.